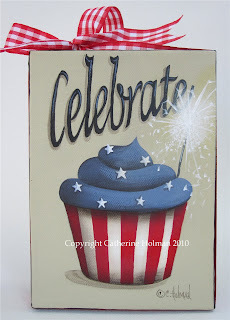 This little 5" x 7" cupcake painting, "Celebrate", is up for auction on eBay. 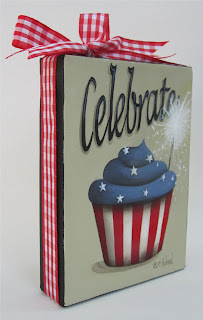 Celebrate the 4th with a bang and a sweet patriotic treat! This delightful confection is baked inside a red and white striped paper liner then topped with blue frosting and sprinkled with tiny white stars. A lit sparkler is tucked into the top of the cupcakeand a red and white checked ribbon is wrapped around the edges of the canvas and tied in a bow at the top. Our son, Eric, will be home from Spain July the 1st, so I'm going to be busy getting his room cleaned and preparing for his homecoming. The 1st can't seem to get here quick enough for me! A partiotic cupcake,this is truely american (hihi). Cathie, what a great cupcake!! Just in time for the 4th!! How exciting to have your son home, Catherine! Happy 4th to you! Love the new cupcake painting. 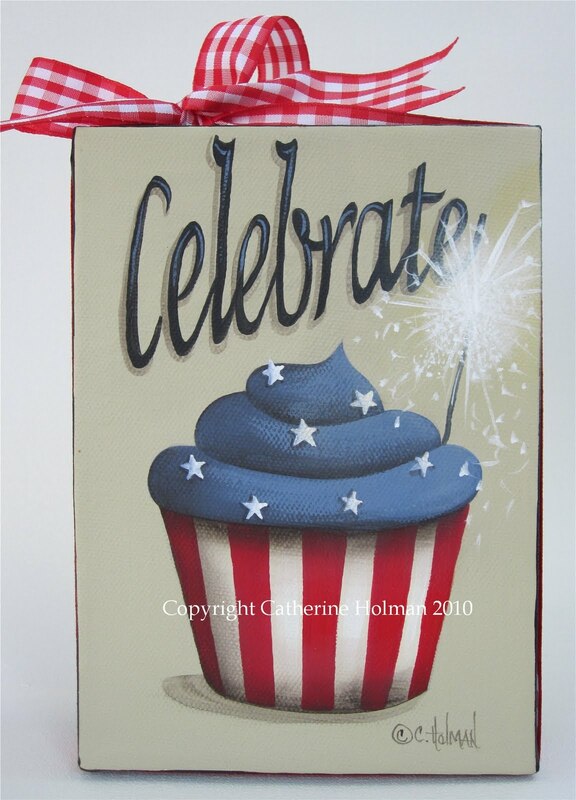 Love your cake from the below post Catherine, just beautiful as is your 4th of July cupcake. Keep up the great work. How wonderful you will be seeing your son soon, enjoy the time with him. I love the patriotic cupcake and babycakes! Enjoy your son's visit! I love this idea and it is so adorable!!! I am happy for you that you get to spend time with your son!! !